Island Barn is roughly circular, which means that when you are in the thick of the race it can be confusing to see where you are. 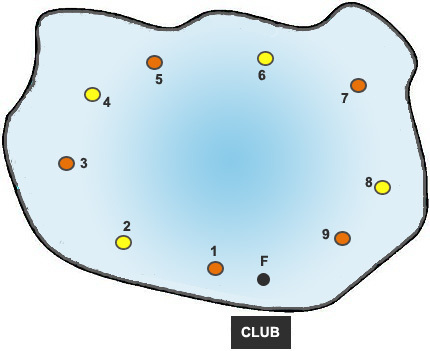 So here's a map showing our buoys: they run clockwise round the reservoir (as seen from the point of view of a hovering seagull), and are numbered 1 to 9, with the 'F' mark in front of the clubhouse. Odd numbers are spherical orange buoys, and even numbers are yellow cans. In addition there us also mark X, a round orange one without a top which leads a peripatetic existence, being available to be placed wherever the race office finds it useful. The two main landmarks are the clubhouse opposite 'F', and the grandstand for Sandown racecourse about half a mile away on the opposite side.